Which Film is the Best? Today you have many more overlaminate options for floor graphics than were available ten years ago. Polycarbonate and vinyl films — most of which are pressure-sensitive — are often used to protect floor graphics. Heat-activated overlaminates are also available. Clear protective films can be applied to encapsulate the front and back of the paper print. The overlaminates overlap the print on all sides by 1/4 in. or more to form a waterproof barrier. Several manufacturers, including RTape, offer specially designed overlaminates for floor-graphics applications. Although many printers have opted for the less expensive vinyl films, polycarbonate overlaminates are still your best choice for long-term, demanding applications. These polycarbonate films are tougher, more scratch resistant, and will withstand the extraordinary abuse of foot traffic, dirt, grease, grit and chemical cleaners. While polycarbonate overlaminates are available a variety of thickness, a 3 mil is ideal for floor graphics protection. With a lower profile than heavier films, shoppers are less likely to trip on the edge of the graphic. The velvet texture of a polycarbonate film also provides excellent, slip and scuff resistant protection for floor graphics. 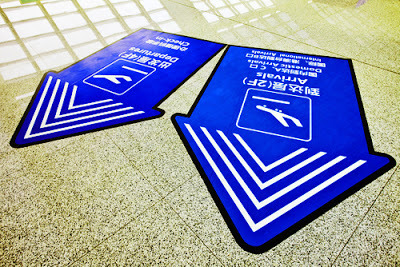 To ensure a floor graphic is slip-resistant, overlaminates are rigorously tested. The standard industry test, the American Standard for Testing Materials (ASTM) D2047 exam, checks the coating’s coefficient of friction. In layman’s terms, this is the force required to move one material over another. In short, the ASTM test measures the traction pedestrians could expect when walking on a floor graphic.